Wonderful Weekly Giveaway -- Jane's Card Sampler Pack! A new newsletter... new sponsors... new techniques... a new giveaway! Today's giveaway is for something unique and certainly something most of us need. The giveaway is for one of Jane's Card Sampler Packs! Jane Hignite is a long time Technique Junkie, who also happens to have created the Pierced Spotlight Technique in the new February edition of the TJ Newsletter. Jane has these wonderful Card Sampler packs that are great for protecting all of the wonderful artwork you create! The lucky winner of the giveaway will receive a card sampler pack, along with the card on the left. This card uses the Mono Masking Technique from the NEW issue of the TJNL (February 2009). The stamps used here are from I Brake for Stamps -- one of the TJ vendors, with a link for a discount on the right of my blog. You know that I LOVE the IB4S line -- and and this collection is very elegant. In addition, the paper I used on this card is from Paper Temptress, another TJ vendor. Let me tell you, this paper is exquisite. 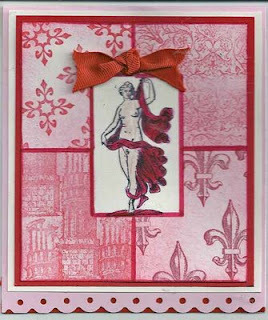 The paper is from the Paper Temptress' Valentine Pack - I used a bit of the Blanc Sparkle, the Vermilion Sparkle, and the Cotton Candy pop tone to create my card. It is a shame that I was unable to get a good shot of this card -- the paper is just to-die-for! Use the discount code on the right sidebar of my blog to treat yourself to some of this luscious paper today -- you will be so happy you did! "Looking for an easy way to organize your card samples or stamping ideas? My Card Sample Protector Packs are just the product you're looking for! With this system, card samples are easy to arrange, rearrange, and store. They protect your samples from wear and tear, stains, and sticky fingers. The sturdy packs are easy to flip through without wrecking the samples themselves. I've used this system for over 8 years and still use my original packs! I have hundreds of happy customers - demonstrators and non demonstrators! You can use these packs to group samples from one stamp set, one technique, or one theme...or group them in any other way. This is a fabulous way to take what you need to workshops, conventions, or group meetings! No bulky binders needed! Each packs comes with 25 sleeves for 50 viewable samples. There is a hole punch at the top of each with a binder ring grouping the pack. The sleeves are 5" x 7" - with the hole, the usable space is about 5" by 6.5". Extra binder rings are available (2 for $1.00) if you would like more "packs" with the same amount of sleeves. Each pack is $5.00, and shipping costs vary depending on the number of packs you order. I can ship up to 30 packs in a Priority Mail Flat Rate box ($10.35 - new USPS pricing 1/18/2009). For the TJ Giveaway, I am offering a huge special - PURCHASE 3 PACKS FOR $15.00 AND RECEIVE 1 PACK FOR FREE! With shipping, the total for this special is $20.00. 1 special order per customer. To enter the give away for today, simply leave a comment on this blog entry telling me that you would like to enter by 11:59pm EST on Sunday, February 1st. No other entry methods will be included in the give away. If you email me to enter, your entry will NOT be considered a valid entry. When you leave the comment, make sure to put your NAME in the comment -- if you enter your comment as "Anonymous", I cannot give you the prize! Blogger does NOT record your email address for me, so you will need to check back to find out if you have won or include your email address in your comment so that I can notify you. A good way to do this is like so: phuntoon at optonline dot net -- it will help protect your privacy! I will have a random number generator pick one number from the comments to select one winner. Each give-away is separate, so to be eligible for a specific item you must enter that day's contest on the post where it is listed. Enter today -- good luck! Congratulations to Cindy Key, the winner of this giveaway! I haven't had an opportunity to play in a Blogger's Challenge for a long time, so I was thrilled to be able to jump in this week. The challenge was to use Black, Red, Kiwi and White in our creations. 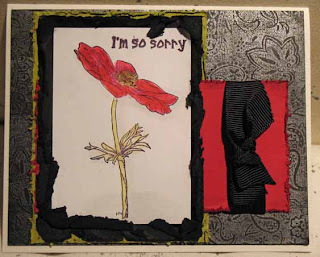 The poppy and saying stamps are from Firecracker Designs by Pamela. That panel is on a Torn Frame, a technique from the December 2008 issue of the Technique Junkie Newsletter. The black Stampin' Up! paisley background was stamped with VersaMark then brushed with Pearl Ex to give it some shimmer. I love these stamps from Rare Image Rubber Stamps. The stamp sheet is jam-packed with cats and dogs, and of course, there are a couple of mice in there, too! These high-quality rubber stamps will be sent to the winner of the giveaway, along with the card shown above. 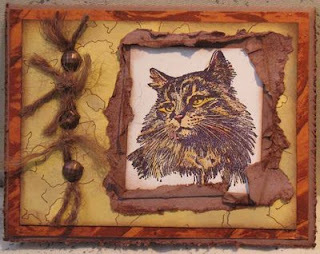 The card highlights one of the cats from the stamp sheet in a Torn Frame (from the December 2008 issue of the Technique Junkie Newsletter). The background is a piece of Camouflage (from the October issue of the Newsletter). I added some thick yarn to the side -- after all, don't all cats love yarn? As a special from Rare Images, If you order the Pets sheet, the garden sheet, or both, the shipping is only $1.00 this week. Only a dollar! What a great deal. To enter the give away for today, simply leave a comment on this blog entry telling me that you would like to enter by 11:59pm EST on Sunday, January 25th. No other entry methods will be included in the give away. If you email me to enter, your entry will NOT be considered a valid entry. When you leave the comment, make sure to put your NAME in the comment -- if you enter your comment as "Anonymous", I cannot give you the prize! Blogger does NOT record your email address for me, so you will need to check back to find out if you have won or include your email address in your comment so that I can notify you. A good way to do this is like so: phuntoon at optonline dot net -- it will help protect your privacy! I will have a random number generator pick one number from the comments to select one winner. Each give-away is separate, so to be eligible for a specific item you must enter that day's contest on the post where it is listed. Enter today -- good luck! The winner of this giveaway is Holly Hughes! Congratulations, Holly! I am the new Tips and Techniques Column writer for RubberStampMadness Magazine! My debut issue is in mailboxes now and will be on newstands next week. Make sure you pick your issue up to see my debut! The card on the right uses my first technique in the magazine, a quick and easy collage. This is a piece that was not in the magazine. I wish you all could see the sparkle on this piece -- it's gorgeous! Today's Wonderful Weekly Giveaway is this sweet set from Sweet 'n Sassy Stamps. This set, Hugs for Janessa, was created by Korin Sutherland in honor of her niece Janessa who is a special little girl. She was born with Down Syndrome and at 18 months was diagnosed with leukemia. You can find out more about Janessa HERE. 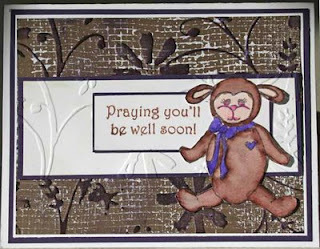 The card I made from this sweet set uses a painted mesh background (December 2008 Technique Junkie Newsletter). To add more visual interest, I ran the painted mesh through the Cuttlebug and highlighted it with purple ink. The bear was colored using the Marker Watercolor Technique (June 2008 issue). The card and stamps will be sent to one lucky winner, but don't fret! Sweet 'n Sassy Stamps has 20% off of everything right now! Hurry over to the site to save! To enter the give away for today, simply leave a comment on this blog entry telling me that you would like to enter by 11:59pm EST on Sunday, January 18th. No other entry methods will be included in the give away. If you email me to enter, your entry will NOT be considered a valid entry. When you leave the comment, make sure to put your NAME in the comment -- if you enter your comment as "Anonymous", I cannot give you the prize! Blogger does NOT record your email address for me, so you will need to check back to find out if you have won or include your email address in your comment so that I can notify you. A good way to do this is like so: phuntoon at optonline dot net -- it will help protect your privacy! I will have a random number generator pick one number from the comments to select one winner. Each give-away is separate, so to be eligible for a specific item you must enter that day's contest on the post where it is listed. Enter today -- good luck! By the way: My emails are back up and working. It is VERY possible that I did not receive emails from some people for at least two months. If you have emailed me and I have not responded, please email again -- I am not avoiding you, I just didn't get your first email! Congratulations to Holly Fotty, the winner of this giveaway! I am going to explain the wonderful giveaway first, then there is a long apology letter below. Not mandatory reading, but if you are wondering about my absence, it helps explain it! (Plus it was unbelievably cathartic to write it all down). 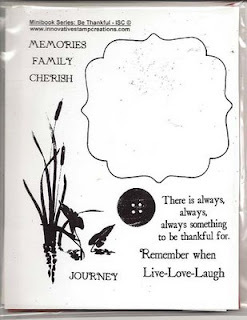 Today's Wonderful Wednesday giveaway is from Innovative Stamp Creations. The gorgeous rubber stamp sheet below will be sent to one lucky winner along with the card at the left. 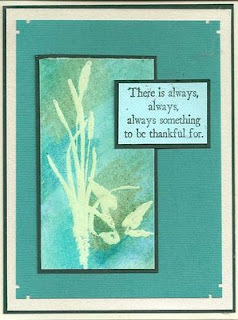 The card was made using the Watercolor Resist Technique from the December 2008 issue of the Technique Junkie Newsletter. 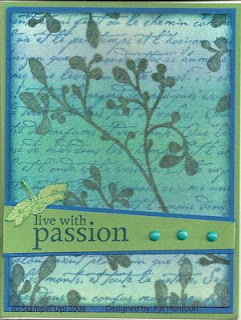 I find these colors peaceful and serene, and they work perfectly with these pretty stamps, don't they? If you like these stamps, make sure to use the code for the discount to Innovative Stamp Creations in my sidebar. Betsy has a whole slew of new stamps for you to ooh and ahh over! To enter the give away for today, simply leave a comment on this blog entry telling me that you would like to enter by 11:59pm EST on Sunday, January 11th. No other entry methods will be included in the give away. If you email me to enter, your entry will NOT be considered a valid entry. When you leave the comment, make sure to put your NAME in the comment -- if you enter your comment as "Anonymous", I cannot give you the prize! Blogger does NOT record your email address for me, so you will need to check back to find out if you have won or include your email address in your comment so that I can notify you. A good way to do this is like so: phuntoon at optonline dot net -- it will help protect your privacy! I will have a random number generator pick one number from the comments to select one winner. Each give-away is separate, so to be eligible for a specific item you must enter that day's contest on the post where it is listed. Enter today -- good luck! I must apologize for the lack of giveaways -- or even blog posts -- in the last few weeks. My life has been a comedy of extreme highs to extreme lows in the last three weeks. I went from the joy and wonder of the Christmas season to the depths of a roof-leaf, to the holidays, to having to put my faithful dog of 15 years to sleep. Throw in traveling for 5 days, company, and trying to paint a picture of complete normalcy for my kids sake, and you have a very insane person on your hands (that would be me!). Oh, did I mention that my emails were not working for TWO weeks? I was reading emails and responding to them, but I had NO IDEA everything I sent for two weeks was not delivered. It all appeared so normal! Um, I have a newsletter to publish, so when I was not on the phone with Customer Support in India (with which company? You name it, I have spoken to all of them!) I am desperately trying to create a beautiful and rich newsletter document filled with all of the fabulous techniques we have in store for you for February. Keep your fingers crossed that I have fixed my issues (although I cannot access old emails or my email contact list). So, I have been out of touch. I know you forgive me. I haven't stamped in WEEKS -- and tomorrow I am promising myself to dirty my hands for a while! My Best Regards for a Happy 2009. The winner of this set is Christine O'Connor! Congratulations, Christine!